If you started your bachelor or master programme in 2015-2016 or later, you need to register for all parts of your programme. You can only attend courses or exams for which you have a valid booking. This includes access to the course materials, such as the course manual and recordings. Register online via the Student Portal during the designated booking windows. The Student Portal will alert you when a booking window is open. As from 1 June 2018, you can book your courses for the entire year. By already registering in advance, you reduce the chance of not being able to participate in a course. Booking courses and exams is your responsability, make sure you do not miss a booking deadline. You have to book all courses, practicals, skill trainings and exams and resits that you will be taking in this academic year. For new students: the first period of the first year (Bachelor and all Masters) will be booked by the Education Office. This does not include any resits later in the year. See the course catalogue for the courses of your programme. 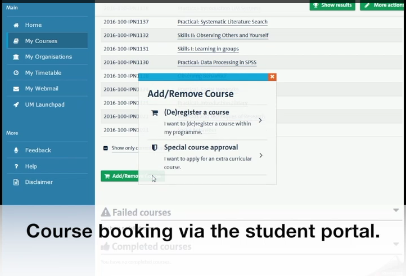 The booking interface may also show you courses from different study years or other programmes, which you do not need to take. • A course booking always includes the first exam. You do not need to book the first exam separately. • A course booking does not include the corresponding practicals. You also need to book those modules yourself. • As from 1 June 2018, you can book your courses for the entire year. By already registering for the entire year, you reduce the chance of not being able to participate in a course. • Third-year Bachelor students (also those who take electives at another faculty in the Netherlands or abroad): for period 1 you need to book Skills V, the corresponding practicals Portfolio and Quick Career Advice, and of course the modules in period 4, 5 and 6. • Courses that have entrance requirements can only be booked once the entrance requirement has been satisfied. Course with entrance requirements are: Portfolio Practicals, Research Practical PSY2027/IPN2027, Statistics II PSY2028/IPN2028, Statistics III PSY3008/IPN3008, and Psychodiagnostics PSYPN3109/IPN3109. See art. 4.2 of the Education and Examination Regulation for details. • See below for courses where your preference matters, such as 'Discover Psychology', 'Action' and 'Psychodiagnostics'. • The booking interface may also show you courses from different study years or other programmes, which you do not need to take. • All 1-year Masters except Work & Organisational Psychology: make sure to book Academix Skills PSY4075. • 1-year Master Work & Organisational Psychology: make sure to book Research Methods PSY4094, Professional Skills PSY4096 and Activity Report PSY4097. after the course, and a resit later in the year. have fullfiled the attendance requirement. the repeat education sessions might help you to prepare for the exam. • For each first exam, there is a second exam (resit) later in the year. in which the resit takes place. See the exam schedule for the exact dates, times and locations of resits. If you did happen to book one of these modules yourself, this is not a problem and the module does not need to be cancelled. Some parts of the curriculum require you to make a choice. In most cases, you need to book the selected course(s) yourself. In year 3: Choose your practical for the course 'Action'. For "PSY3155/IPN3155 Group Decisions": book this practical together with and "PSY3012A/IPN3012A Action"
For ''PSY/IPN3156 Neuronal basis of decision making ': book this practical and 'PSY3012B/IPN3012B Action"
In year 3: choose your practical for the course 'Psychodiagnostics'. For ''PSY3158/IPN3158 The diagnostic Cycle": book this practical and "PSY3109B/IPN3109B Psychodiagnostics"
PSY4156 Course Elective, PSY4157 Review Elective PSY4158 Research Elective: book these via the electives coordinator. See Electives. The 'Information Session' appears in My Timetable with the codes PSY5555, PSY5556, PSY5557 (Bachelor), PSY6000 (Masters), PSY7000 (Research Master), PSY8000 (Master Forensic Psychology). The Education Office books these sessions for you.